NEW YORK — Gov. 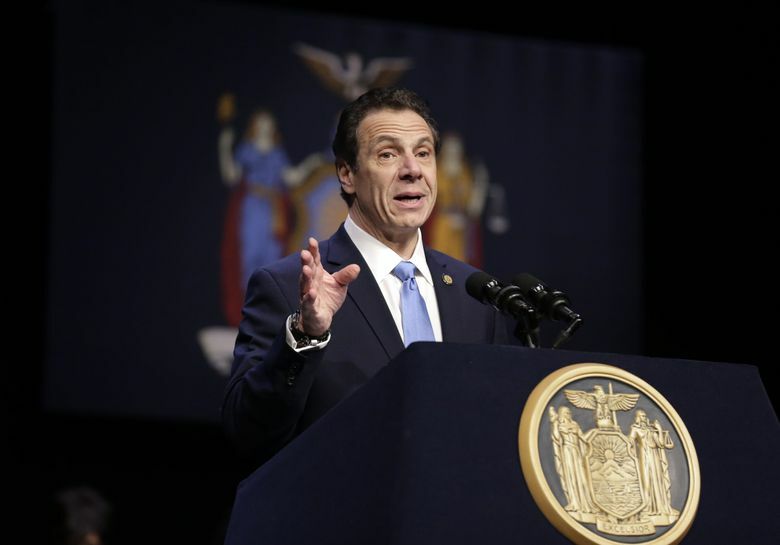 Andrew Cuomo, who was staggered by Amazon’s decision to pull out of its plans for a campus in New York City, is furiously working behind the scenes to lure the company back, even connecting with Jeff Bezos, Amazon’s founder and CEO, to make a personal pitch. The governor has had multiple phone conversations with Amazon executives, including Bezos, over the past two weeks, according to two people with knowledge of the efforts. In those calls, Cuomo said he would navigate the company through the byzantine governmental process. Cuomo did not offer a new location but rather guarantees of support for the project, one person said. Amazon executives gave no sense that it would reconsider. The executives also learned of an open letter being arranged for publication in The New York Times on Friday, also urging Bezos, the company’s chief executive, to reverse course again and build the campus in Long Island City, Queens. The letter was signed by supportive unions, local businesses, community groups and elected officials including Reps. Hakeem Jeffries of Brooklyn, a top Democrat, and Carolyn Maloney, whose district encompasses the Amazon site, and former Mayor David Dinkins. So far at least, the company has shown no sign of reconsidering its decision to abandon the deal, in which Amazon promised to create up to 40,000 jobs in Long Island City in exchange for a state grant of $500 million and state and city tax breaks that would have eventually totaled more than $2 billion. The campus was meant to be one half of what had been dubbed a second headquarters for the company; the other half, with roughly the same number of jobs, is still planned for a Virginia suburb of Washington, D.C.
On Thursday, an Amazon executive addressed the opposition in New York and the company’s decision to leave rather than face it down during an event in Virginia. The conversation between Cuomo and Bezos appeared to have been the first time the two had spoken at any point about Amazon’s plans for Queens, or about the company’s abrupt decision earlier in February to cancel the project amid noisy opposition. Since the deal fell through, Cuomo has been arguing in public and in private that support for the project was and remains far more widespread than it may have seemed. He reiterated that message to Amazon executives during their calls, according to one of the people with knowledge of the exchanges, both of whom requested anonymity in order to discuss the private conversations. But Amazon faced vociferous opponents — including local groups, some unions and political activists animated by the surprise victory of Rep. Alexandria Ocasio-Cortez — from the moment it announced its plans for Queens in November. Three months later, with no end in sight for the sustained political pressure and negative attention, executives decided to pull the plug. Those familiar with the company’s thinking have insisted that the decision to abandon the New York City plan had been based on a confluence of factors, including the loud opposition and the lack of any sign it would abate. The advertisement, an open letter to Bezos that was set to appear on a full page in Friday’s newspaper, is aimed at combating the notion that the opposition to Amazon was widespread, arguing that a “clear majority” of New Yorkers support the company. “The governor’s office was working with the business community on how to send this message,” Wylde added, and the result was the letter. Many of those signing on to the letter — including public-housing leaders, unions like Local 32BJ of the Service Employees International Union and the Building and Construction Trades Council of Greater New York — were supportive of the deal all along. The most vocal opponents were not among the signatories. One thing that has changed in the last two weeks: Andrea Stewart-Cousins, the Democratic majority leader of the state Senate, withdrew her nomination of Sen. Michael Gianaris to the obscure Public Authorities Control Board. The position would have given Gianaris, who represents Long Island City, the ability to vote down the development project for Amazon when it came before the board in about a year’s time. But Cuomo refused to appoint Gianaris — or to formally reject him. And so last week, Stewart-Cousins selected another Queens representative, Leroy Comrie, to sit on the board, a person who would be more likely to get the governor’s approval.